Ozone is formed at ground level by a chemical reaction between Nitrogen Dioxide (NO2) and/or Volatile Organic Compounds (VOC's) and UV rays from sunlight. The difference between this unhealthy ozone production and commercial ozone production, or natural ozone production in our ozone layer, is that ozone production from smog is an unhealthy cycle that is hard to break. In ozone production from smog the air quality is altered long term, ozone does not simply break down into harmless oxygen, but instead recombines to form NO2 in the atmosphere and re-start the unhealthy cycle again. See image below for example. 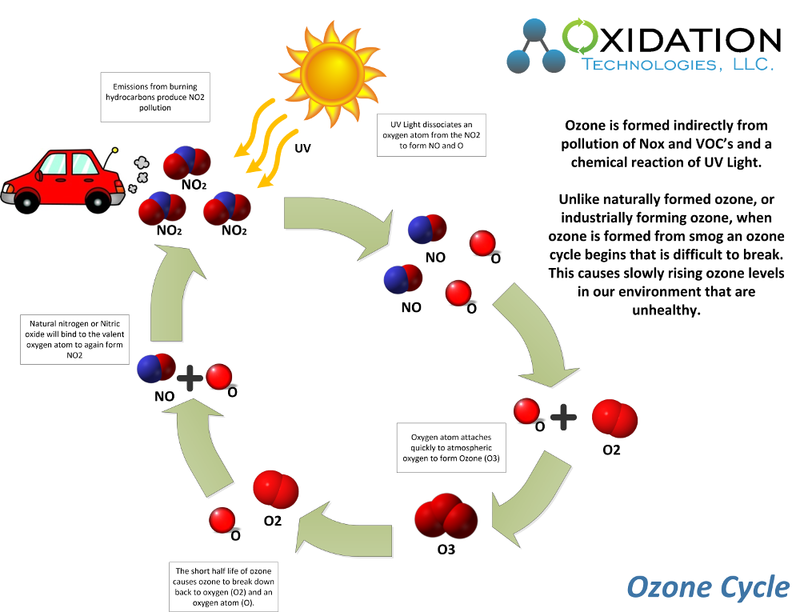 When ozone is produced naturally without the presences of other harmful contaminates like VOC's and NO2 the ozone breaks back down naturally into oxygen. This is a normal result of the instability of ozone and the short half-life inherent with the ozone molecule. The important consideration to ozone production from smog is that ozone is not the cause of the air quality concern, but the result. Excess NO2 and VOC's in the air from pollution will cause this unhealthy ozone cycle to begin. Therefor the EPA has instituted ground level ozone standards. This is important as lowering pollution in our air will lower the unhealthy ozone cycle and improve overall air quality for all people. The most common place in our world to find ozone is the ozone layer. This is a natural and important part of our word. UV light will create ozone from atmospheric oxygen at short wavelengths of less than 240 Nanometers (nm). 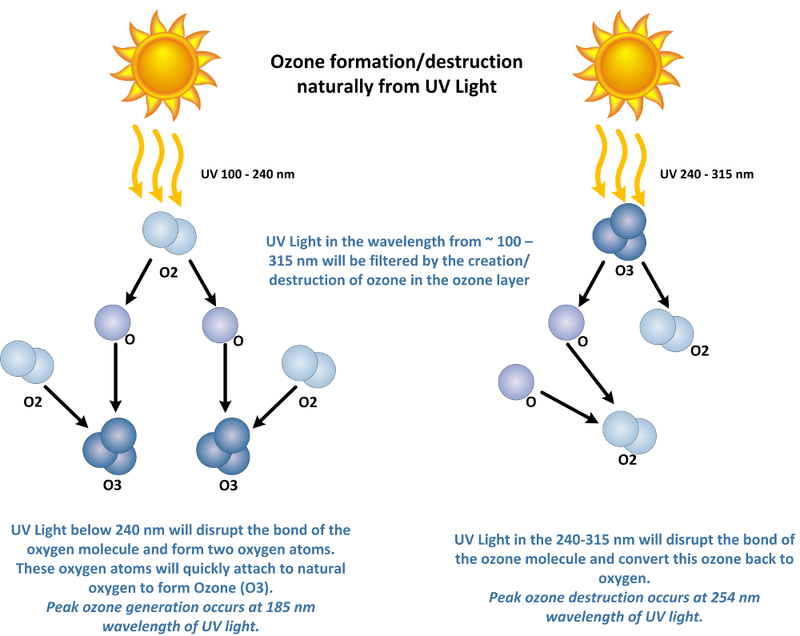 UV light will also destroy ozone and break ozone back down into atomic oxygen (O) and diatomic oxygen (O2) at wavelengths from about 200 nm to 315 nm. Therefore, the ozone layer does a great job filtering UV wavelengths from about 100 – 315 nm. This is important as these are the harmful wavelengths of UV light cause sunburn in humans, and DNA damage in living tissues. The ozone is an important part of our worlds stratosphere. The level of ozone in the stratosphere ranges from 2 to 8 ppm in the ozone layer, therefore most of the atmospheric oxygen remains in the diatomic form (O2). Another element of pollution that is commonly discussed is the potential to disrupt this balance of ozone production and destruction via UV light in the stratosphere. 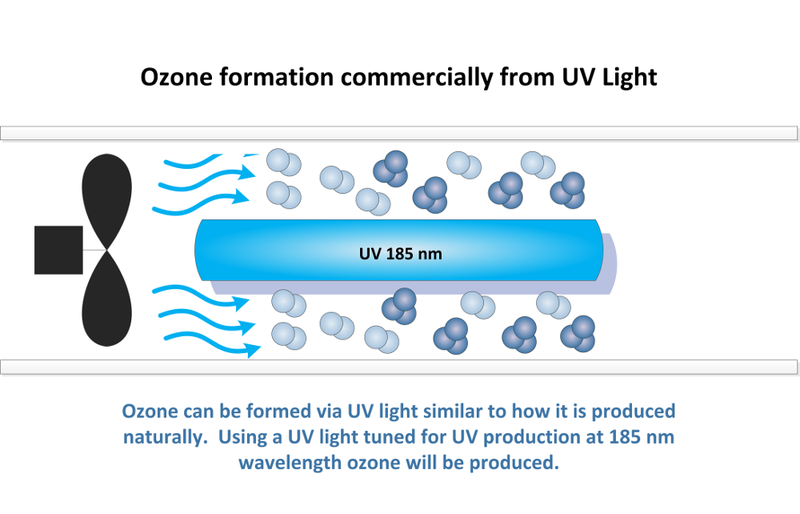 Ozone is produced commercially from an ozone generator using UV light also. Ozone is produced from UV light wavelengths below 240 nm. Ozone production peaks at UV light wavelengths of 185 nm. Using UV lights tuned specifically for a wavelength of 185 nm ozone can be produced from air. Ozone is produced from electrical discharge like a spark. This is why you may smell ozone near electric motors, electric generators, and copy/print machines. These devices and many others will produce low levels of ozone in the air through electrical discharge. When an electrical discharge occurs near the oxygen molecule (O2) found in ambient air it will split this molecule into elemental oxygen (O). These Oxygen atoms will quickly bind to another oxygen molecule (O2) to form ozone (O3). See image below. As shown, lightening is a common and large producer of ozone. 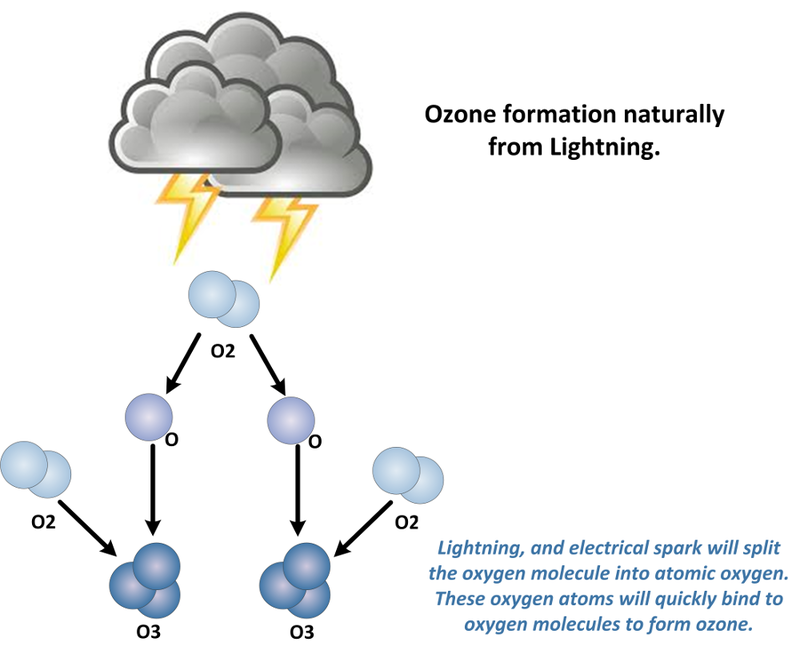 Lightening will produce ozone in air at great quantities from atmospheric oxygen. This may create part of the “fresh” smell or smell of ozone after a thunderstorm. However, research has also shown that thunderstorms can actually pull ozone gas from the stratosphere also. All of these methods to elevate ground level ozone are natural and healthy. The most common method of producing ozone commercially and industrially is electrical discharge, or corona discharge. A corona discharge is simply a diffused spark through a dielectric to spread out that electrical discharge to a large area for maximum efficiency. Ozone can be produced directly in water using electrolytic ozone generators. This has huge advantages as the contacting equipment normally required for dissolving ozone gas into water is not required. Electrolytic ozone generators use an electrical discharge in the water to split the water molecule (H2O) into H2 + O2. This O2 can also be split into O and combine to create O3. 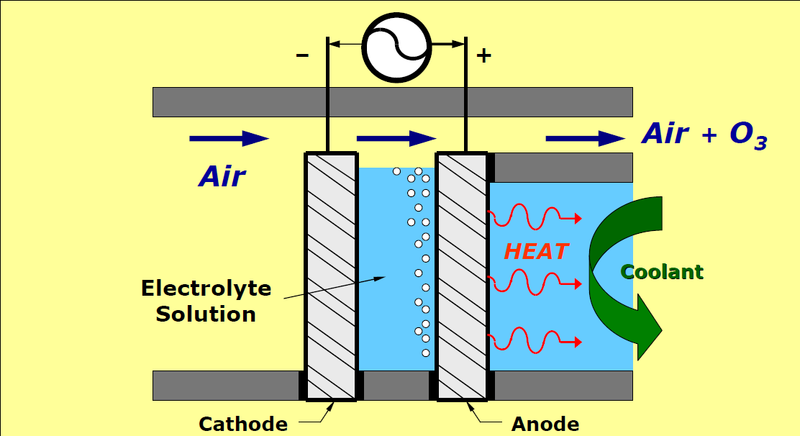 This will require a method to isolate oxygen from hydrogen and electrically charge this oxygen into ozone. Much work has been done working with catalysts, anodes and cathodes to improve efficiencies. However, this method is still unreliable in any water other than ultra-pure water, and is energy inefficient.